The Great Western Steamship Co. was founded by Thomas Guppy with a group of investors and Brunel as chief engineer. Great Western’s keel was laid in 1836 and the ship was completed in 1837. She was the largest steamship built to that date. Most engineers at the time firmly believed that a steam-powered vessel could not carry sufficient coal to complete a transatlantic crossing and still have sufficient room to accommodate passengers. 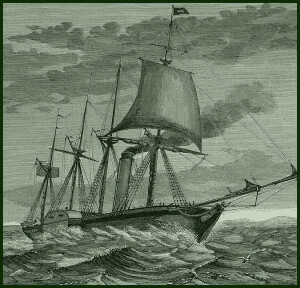 Therefore, it was widely disputed whether a ship crossing the Atlantic powered entirely by steam would ever be commercially viable. Brunel solved the dilemma conclusively by developing a mathematical formula showing that the amount of cargo a ship could carry increased at three times it’s cross-sectional dimensions, while the amount of water resistance encountered by a ship of that size only increased by the square of its dimensions. With his calculations, Brunel proved that a larger ship was actually more fuel efficient than one a smaller design.